When a camp classic from the mid seventies is revamped in the mid noughties it’s bound to have a few contemporary resonances. Take The Stepford Wives where the underlying theme is the quest for perfection – a modern day phenomenon if ever there was one. In the original, which was based on a thriller by Ira Levin who previously penned Rosemary’s Baby, perfection in a woman equates not only to external beauty but to qualities such as housecleaning, brownie baking and all round, general submissiveness. When Joanna (Katherine Ross) moves to the Village of Stepford, Connecticut with her nuclear family she is greeted by a bevy of spaced-out beauties firmly tied to the kitchen by their frilly apron strings and loving every minute of it. Are they on valium? Prozac? Or, as fellow ex-Gothamite Bobbie Markowe (Paula Prentiss) suspects, is it something in the water? Compounding the mystery is the growing attachment Joanna’s husband feels to the Stepford Men’s Association, the members of which are all frankly bland yet have secured themselves these gorgeous, adoring babes. Having ‘messed a little bit with women’s lib in New York’ Joanna decides to challenge the status quo by instigating a Women’s Consciousness Raising Group. But the idea is met with resistance by the Stepford wives who prefer to discuss the efficacy of cleaning products. And so the second, highly relevant theme is introduced; the perils of mass consumerism. In this perfect, man-made world women shop til they drop and love nothing more than pushing trolleys up and down supermarket aisles to the strains of mind-numbing muzak. In a chilling dénouement, the zombification of these women is revealed. However, in the remake, the machinations are exposed much earlier on, turning what was once a sinister story into a raucous comedy. 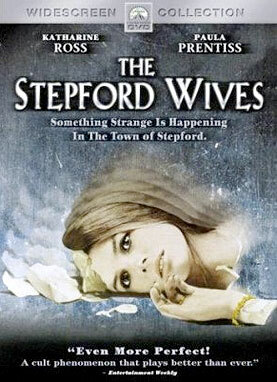 As befits the times, the very qualities that made The Stepford Wives a gay cult favourite have been exaggerated and extrapolated into mainstream movie madness. While the new version may take the story into unchartered, computer-generated territory there are still many nods to the original, giving audiences a great excuse to go back and see how well it stands up (not to mention ogle at the fabulous ’70s hairdos and outfits). But be warned: after seeing both versions you might, as I did, develop a chronic aversion to housework.